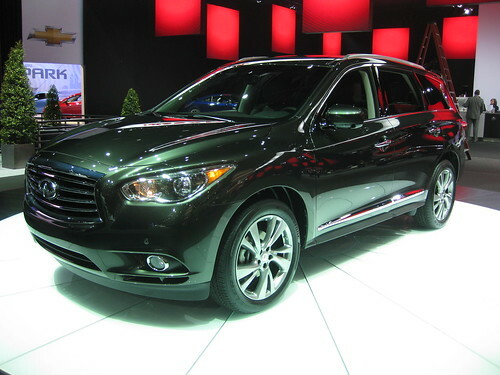 We profiled the all-new 2013 Infiniti JX several months ago but details on the models have become clearer since then. The 7-passenger crossover is an important model for Infiniti, as it takes on the likes of the Audi Q7, Acura MDX, and Volvo XC90. It is the company’s first three-row crossover and its first to have a starting price over $40,000. Nissan has now started production of the model in its Smyrna, Tennessee Vehicle Assembly plant. The Infiniti JX release date is March 2012 in U.S. Infiniti dealerships. Infiniti is claiming class leading fuel economy for the JX. The model’s 265-horsepower 3.5-liter V6 engine gets combined mileage of 21-mpg with front-wheel drive (FWD) and 20-mpg with all-wheel drive (AWD). This is impressive considering the smaller Nissan Murano gets 20-mpg combined with FWD. 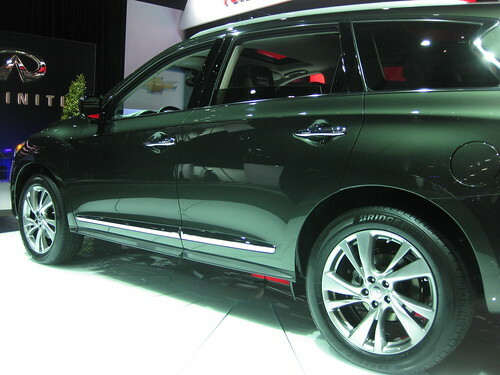 The 2013 Infiniti JX is offered in two trim lines and has a starting MSRP of $40,450 for the JX35 FWD and $41,550 for the JX35 AWD. The model has a wide range of option packages that can push the price up more than $12,000 over the base price. The new JX feature the World’s first Backup Collision Intervention system. The system uses sensors to detect potential obstacles when backing up and provides warnings when obstacles are detected. The system even automatically applies the brakes if the driver does not respond in time. Infiniti also claims excellent legroom in all three rows of the JX. The model’s innovative multi-mode middle seat provides entry to the third row without removing without removing a second row child seat. According to the Tennessean, Nissan plans to hire 1,000 new assembly-line workers over the next year for a second shift at its Smyrna plant for production of the JX and 2013 Nissan Pathfinder. With the 2013 Infiniti JX release date quickly approaching, reservations can be made now at Infiniti’s website.